Getting older does not have to be a drag. With a fun over the hill birthday party, everyone will forget about age and just think about fun. With great gag gifts, how can everyone not laugh? Planning an over the hill birthday party is easy and fun to do. First, set the time and date, a few days before the actual birthday will make for a great surprise. Choose a location (bowling alley, park, or restaurant are good ideas), and write out the guest list; telling each guest to bring old/embarrassing photos is a funny option. Scary music, when the person the party is for, comes in is a hilarious way to get things going! Themed birthday cakes will defiantly set the tone of the party. You can not forget about the fun candle options out there. Fun invitations and games can also be apart of the fun. Of course there is over the hill birthday gifts. Presents do not just have to be plain boring gifts. There are plenty of over the hill gag gifts to choose from, which is great to add to the fun. There are hats, magnets, even tote bags to choose from. A few more over the hill gag gifts include (but not limited to) a walking stick, a fake toupee, jumbo playing cards and don't forget a fake hearing aid! Another idea for an over the hill birthday gift is to make a sort of care package. 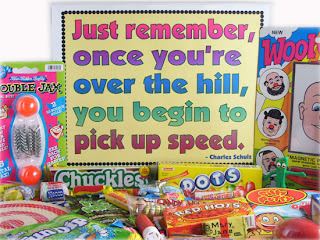 Fill the package with their favorite yummy treats, such as retro candy, and of course even more over the hill gag gifts, for example, a magnifying glass, a shirt saying how old they are, or denture cream! Those usually can produce a laugh or two. To thank the guest who could make it, party favors are a generous option. Cookies or chocolate in the shape of a headstone, key chains, or silly glasses are always fun. Maybe even a nice thank you note. Some over the hill birthday gifts may even be used as party favors for the guests. There are fun beads or necklaces which will remind guests of the fun time they had at your party. Don't forget coasters, buttons, and maybe even some type of noise maker. Water bottles that you decorated yourself are also fun and very unique.Your guest surely will appreciate that you thought of them. Whether the main theme is mostly for adults or if kids are joining in on the fun, there is always something for everyone. The ideas just go on and on with what you can do when it comes to throwing an over the hill birthday party. With a little planning, getting over the hill will not be something that people dread but something they can see the fun in. It is a great and loving (yet funny) way to show loved ones you care. With a few tips and ideas in your head, how can everyone not have a good time?